I am absolutely loving these temperatures we’ve had in Charlotte over the past week! It has been so nice and cool in the morning and warms up during the day, it’s the best! I was finally able to break out some sweaters and I wanted to show y’all one of my favorites for fall. I got everything in this outfit (except for the shoes) from Julie’s Boutique. 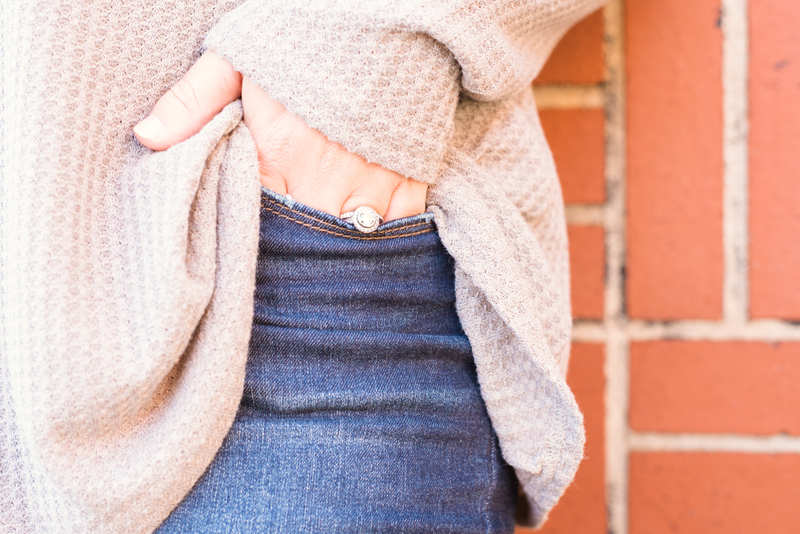 This sweater is under $30 and comes in several different colors. I absolutely love the cold shoulder detail on this super comfortable top! The waffle print makes it so versatile. It could be dressed way down with leggings and a pony tail, or paired with dark jeans and booties for a night out. I am loving the frayed jeans trend right now. This pair from Julie’s is made of the most comfortable material and fit very well. These earrings were under $20, which I love! Statement earrings were so fun this summer, and I fully plan to carry that trend into fall as well. For the past few weeks I have been totally on the fence about mules. Some of them remind me of something my grandmother would have worn. Don’t get me wrong, Jean was a stylish lady, but something about those shoes just rubbed me the wrong way. When I came across this pair of mules with the pearl detail at Marshall’s, I knew I had met my match. I immediately liked them, but when I saw they were on clearance for $15, I was sold!